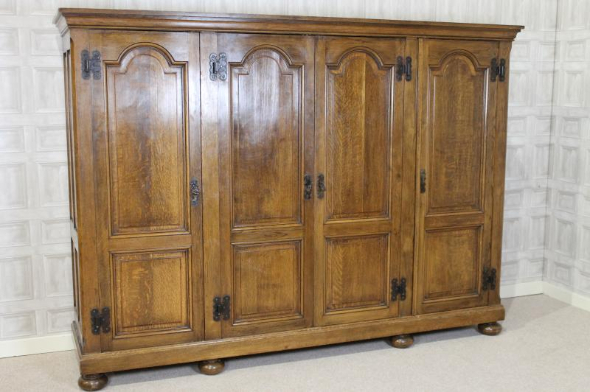 A large and impressive late 1930s solid oak Jacobean style oak wardrobe. In a beautiful mid brown colour, this wardrobe is an impressive piece of bedroom furniture, which conveniently breaks down into individual sections. It can easily be dismantled and reassembled if required. It has four raised and fielded panelled doors; three of which open to reveal full length hanging. One door opens up to reveal an adjustable internal shelf, and there is also a small bank of solid oak drawers. This piece comes with two large keys. The wardrobe is in excellent condition for its age, and would blend in with any period bedroom setting. If you would like any further information about this Jacobean style oak wardrobe or any of our items please call us on 01543 375872.